The regulatory texts classify buildings on the basis of the risks inherent to each building type (height, occupancy, activities etc.) and indicate the requirements that must be met for fire safety. The regulatory texts are the only applicable reference documents and must be consulted in total. ERPs are classified in five categories and types. The building type depends on the use type. The categories are determined based on public and staff occupancies. 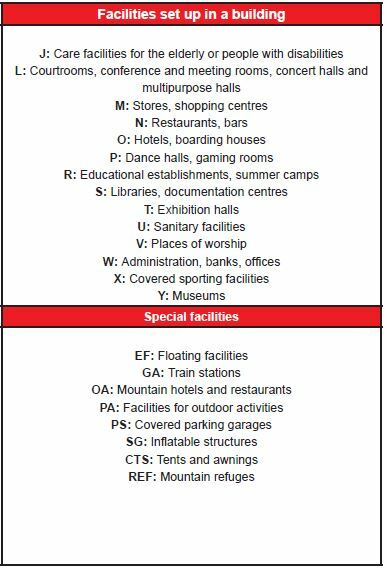 establishments mentioned in Article R 123-14 in which the public occupancy rate does not exceed the number specified by the safety regulations for each type of business. The following classifications only apply to establishments in categories 1 to 4. An IGH is a building over 50m tall for residential buildings or over 28m tall for other types of buildings. 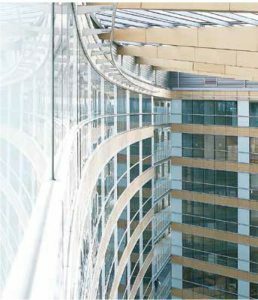 An ITGH is a building over 200m tall. Decree of 18 January 2012 (which supersedes that of 18 October 1977) includes general measures applicable to all classes of IGHs and special provisions applicable to the different classes of buildings.